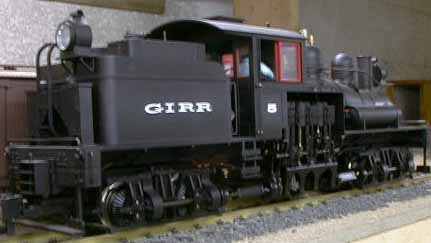 A Bachmann Shay has been modified for the tight height clearances of the GIRR Mountain Division. 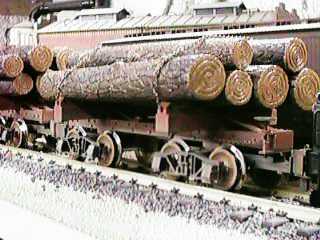 The original Bachmann diamond stack was simply removed and replaced with a modified stack from a junker RC Big Hauler. 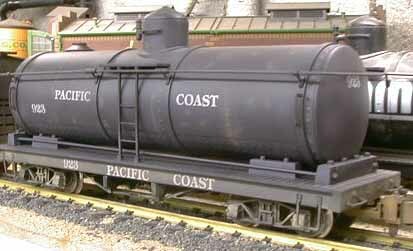 A light overspray of engine black over the silver plastic matched the smokebox color of the Shay nearly perfectly. The steam dome had a 1/4" section removed from its center and has been glued back together, sanded and painted. The split line is virtually invisible. The cars below were airbrushed with a light basecoat that was similar to the base color of the car. This fades out the lettering. They were then airbrushed lightly with PolyScale Earth to fade them further. 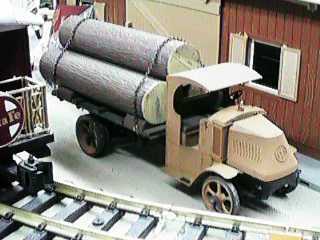 A heavier layer of Earth was sprayed on the trucks and the bottoms of the cars to represent splashed dirt. 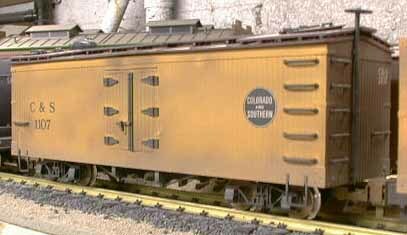 The wheels have been painted Roof Brown.